It really blows my mind that any developer could release a game like The Graveyard and think it is a good idea. I do not even mean that in the sense that it was an incomplete game; I mean that as in this game was dead on arrival (no pun intended). In concept, one can already tell that The Graveyard does not even attempt to be a good game. I will do my best to keep this review from devolving into a rant, but I cannot make any promises. 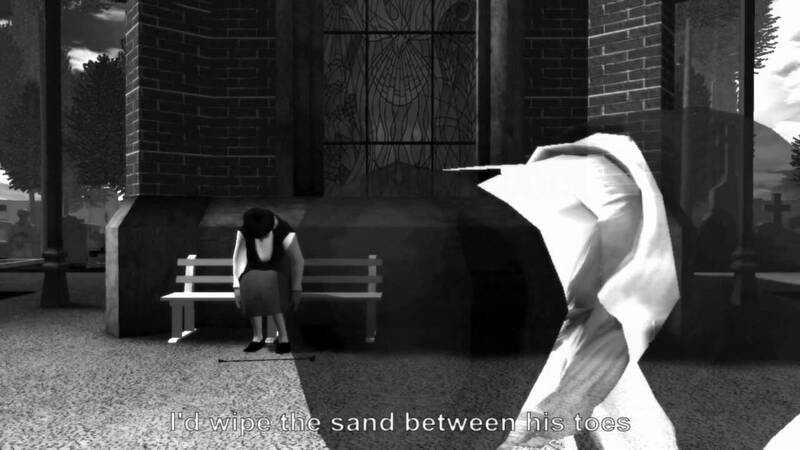 In The Graveyard, you play as an old woman who is walking slowly to a bench. You then sit down on the bench, wait for five minutes while a very bland and droning song sang in German plays. Afterwards, you get up and walk out of the graveyard; that’s it. One may naively think that I am just being snarky and leaving out exactly how these events occur, but I am not. That is literally all that happens in this game. There is only one difference between the free trial version and the full paid version of the game; that being the possibility that you will die randomly. Of course, this adds nothing of value to the game to make it worth the extra five dollars so it doesn’t really matter either way. You still have a game that you complete, start to finish, in under fifteen minutes. It is not even as if there is any amount of substance to these fifteen minutes either. Gameplay consists of holding the up arrow key and walking forward. Even worse is how slowly your character walk, which makes it take about five minutes to get to the bench. You then wait on the bench for five minutes doing absolutely nothing, and then walk back the way you came in which takes another five minutes. That is the entire game. In order to dig for positives, I guess I can say the art style and sound quality are decent, but that is pretty much it. There is nothing of any remote value to gain from this type of game. Some people may want me to believe this game is supposed to make an artistic statement or to invoke an emotion, but nothing happens. In order for a game to make you feel something, it needs to connect with you. A game cannot connect with you if it does not have anything for you to connect with. Exactly how am I supposed to get any enjoyment out of this game? Is it supposed to be some type of deep abstract game with hidden meanings and themes to it? If so, then why can’t the same rule be applied to any other bad games? Why not claim that Superman 64 made you fly through rings and had Superman trapped in a virtual maze to symbolize how life is like a virtual maze and how all of us need to fly through rings in our own day to day lives? Being able to manufacture your own enjoyment with a game does not make it a good game. One can find enjoyment sitting with a stick and a rock in the back yard. Hell one can probably get more enjoyment from said stick and rock than from this game. There really is nothing more to say, this game is simply worthless. I have thought for a bit about whether I was too close minded in my previous review. I have come to the conclusion that I may have been running a bias steamroller over it back then, but my actual opinion has not changed all that much. I don’t think that The Graveyard is a good game but there are some things I wish I would have gone into further detail over. The game’s developer Tale of Tales has described The Graveyard as more of an interactive painting than a game. It’s kind of their whole thing that they don’t make traditional “games” but instead make abstract art projects in video game form. Fittingly enough that is precisely how I described Yume Nikki, a game that I’m not overly fond of but am able to see why. I no longer consider The Graveyard to be on the same level of quality as titles like Vickinachi or The Interview but I find it sorely inferior to even games like Gone Home or Dear Esther, neither of which I liked to sound like even more of a broken record. The key problem with The Graveyard compared to those games is simply a lack of substance or content. The gameplay video on its Steam page literally shows the entire game. The Graveyard is a type of game that can only be enjoyed by people specifically looking for this type of experience; it’s a game that was made solely based on its developer’s vision. It’s basically like one of Coda’s games if they were put up for sale. Anyone who likes the game will have likely already decided they like it before they even play it. Anyone else who plays the demo just to get a feel of the game will not be impressed. The reason is because the ability to die is an integral part of the message this game was going for; that anything may have heavier weight knowing you can die at any moment. Demos are normally meant to entice players to play the full game and to leave something out, but most do this by offering a portion of the full game or by creating an experience similar to the final product but that isn’t the same (which Tale of Tales actually did do with their later game The Path). The main reason why I still use the Steam Greenlight Landfill moniker for this review is the fact that there should not be a $5.00 price tag for the ability to die. Even with that option added, most of the core gaming audience will not find this game worth the money. The only reason that there is a paywall behind the ability to die is, I assume, to nickel and dime anyone who is interested in the full experience. Yes I am aware that there are people who spend millions of dollars on expensive paintings that you can’t do anything other than look at, but those people only do so for either collector’s value or because they assign it that much personal value. With a game like The Graveyard, the best way for this game to reach a larger audience would be to release the full version for free thus severing the obligation to fulfill requirements as a “product” rather than a pure work of art. The game can still be somewhat profitable this way as it would be an easier way to promote Tale of Tales other work that DOES have enough content to warrant a price tag (at least from what I’ve seen and played). Unfortunately I just don’t see the value in charging others to play this game when it was clearly made for its developers. This review was originally posted to GameFAQs on August 20th of 2015 and has since been re-edited with enhanced presentation.